Using one of the most versatile wild mushrooms in recipes can be as simple as substituting it for a similar protein in recipes. Chicken mushroom, once properly prepared first, can easily replace real chicken in many recipes calling for cooked chicken, especially cold salads or chilled noodle dishes. 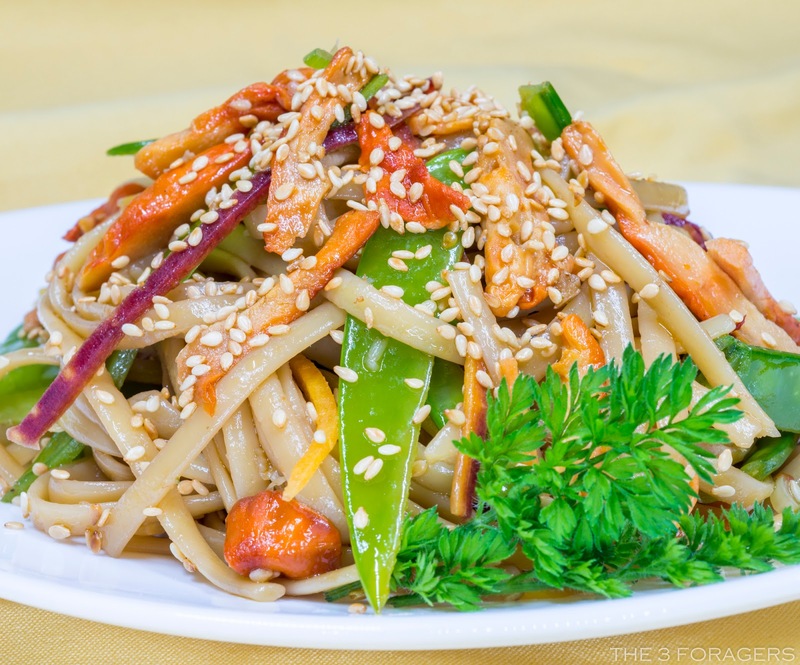 Many of our dinners consist of leftover noodles, rice, or other things in the refrigerator with cooked mushroom added, plus a fresh sauce used to make a cohesive meal. I don't often have a "recipe" for what we make since we just make dinner with what we have, but this time I wrote down what was in the dressing, and it happened to turn out really well! 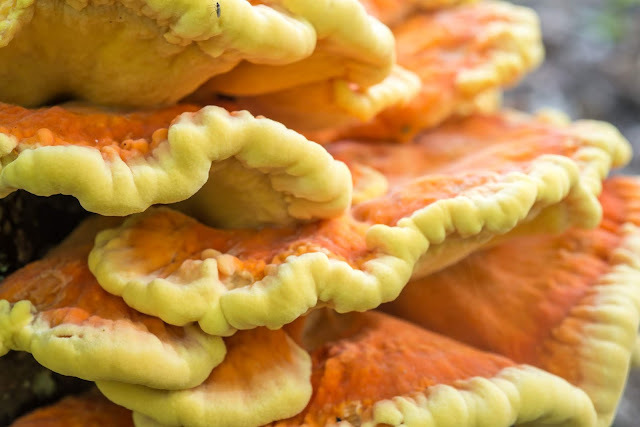 The keys to working with chicken mushroom as a chicken substitute are to collect a specimen in good shape and to cook it well. Collect a young enough specimen where the fronds are plump and still ooze a yellow juice when cut; they will be brightly colored. 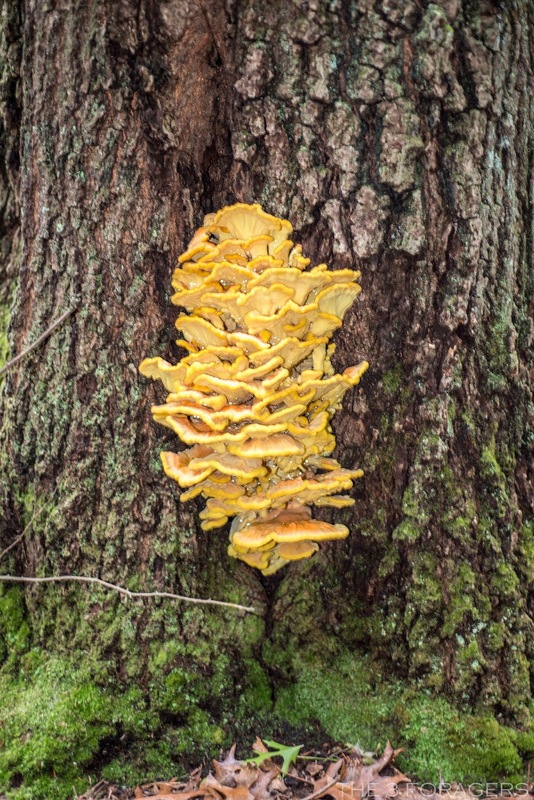 If the fronds of chicken mushroom are thinner and have dried out, no matter how much butter or oil you add, or how long you cook it, the mushroom will still feel like wet sawdust in your mouth. Once you have decided whether you want to cut the pieces into cubes or into strips, you can saute them in very little neutral oil in a pan, until lightly browned, don't drown them in olive oil. Olive oil has a low smoke point and is too strongly flavored to use at this point in cooking; use something flavorless like sunflower oil, grapeseed oil, safflower oil, or vegetable oil. Lightly turn the chicken pieces to keep them from sticking, then add some hot or boiling water to the pan to cover the chicken mushroom, and poach for about 5-8 minutes.You will lightly simmer the mushroom until the water has evaporated. At this point, you'll need to watch the pan and might need to add a bit more oil to keep the mushroom from sticking and give it a stir.All of this cooking ensures the mushroom is cooked enough and will hopefully alleviate any reactions that some people experience from eating under-cooked polypores. The cooked chicken mushroom can then be incorporated into any recipe you like hot, or chilled. The cooked chicken mushroom can also be tightly packed and stored in the freezer for later use at this point as well. 1. Make the dressing: In a small saucepan, add the minced garlic, sugar, oil, rice vinegar, soy sauce, sesame oil, and garlic chili paste. Bring it to a quick boil and stir until the sugar dissolves, a few seconds. Cool. 2. Toss the pasta with the veggies and the chicken mushroom and pour the dressing over the noodles. Sprinkle the sesame seeds over the salad to serve. Note: If you are not serving the salad immediately, it will soak up the dressing, so save a bit of the dressing to add to the salad right before service. 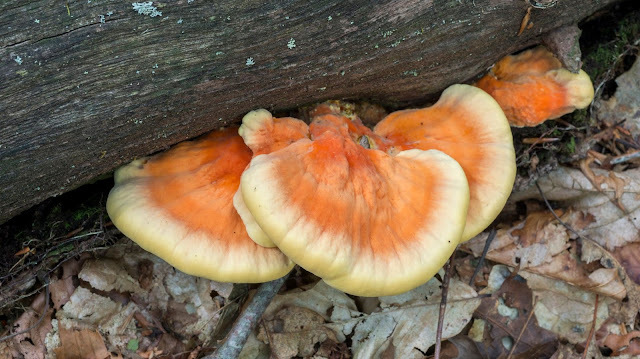 Better add this one to the Chicken Mushroom roundup! I have that one bookmarked!